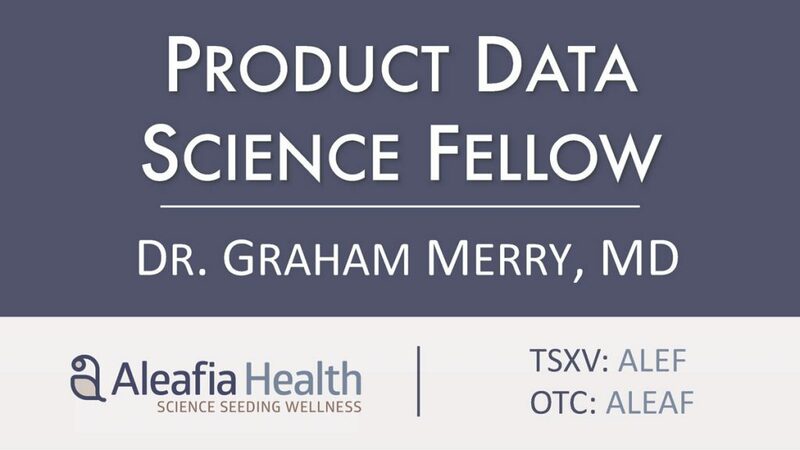 TORONTO, February 4, 2019 – Aleafia Health Inc. (TSXV: ALEF, OTC: ALEAF, FRA: ARAH) (“Aleafia Health” or the “Company”), has appointed Dr. Graham Merry, as the Company’s first Product Data Science Fellow. Leveraging the Company’s proprietary 10 million point medical cannabis patient dataset, Dr. Merry will lead Aleafia Health’s ongoing medical cannabis research. These efforts will be aimed at developing evidence-based, proprietary treatment methods and products for chronic illnesses including pain, insomnia, anxiety and eating disorders. Aleafia Health generated $0.6 million in research revenue in Q3 2018 alone, fuelled primarily by medical cannabis companies subscribing to Aleafia Health’s proprietary medical cannabis patient dataset. Aleafia Health tracks all patient interactions with referring doctors, nurse practitioners and educators from diagnosis, treatment, monitoring, and continuous learning. The highly differentiated medical cannabis patient big data leverages an enterprise-wide proprietary platform data set on Amazon AWS with market leading data visualization and business insights tools powered by Google Data Studio. These tools are uniquely configured based on over 50,000 unique patients. Dr. Merry graduated in Medicine from The Royal London Medical College in London, U.K and is the founder of Photospectra Health Sciences Inc. which focuses on the research and development of treatments for Age-related Dry Macular Degeneration, a common eyesight disorder. He has instigated, been a principal investigator and published clinical trials internationally. The appointment of the Product Data Science Fellow is part of a global initiative by Aleafia Health to build an integrated, scalable cannabis consumer experience, leveraging the Company’s in-house, executive leadership experience at multi-billion dollar eCommerce and IT companies. “The medical and research teams at Aleafia Health are extremely well positioned today with the addition of Dr. Merry. We will continue to make important contributions to the research of medical cannabis treatment best practices and product development,” said Aleafia Chief Medical Officer Dr. Michael Verbora. Current Aleafia Health research initiatives include an insomnia study in partnership with Cronos Group (TSX: CRON, NSDQ: CRON), a cannabinoid pharmacogenetics study with Guided 420 Genetics and U.S. based AKESOgen, and a recently published study in the journal Cannabis and Cannabinoid Research on cannabis and benzodiazepines. Aleafia Health is also pleased to announce the appointment of Dr. Taylor Lougheed as Physician Lead for QI/QA of Clinic Operations. Dr. Lougheed has an extensive history in cannabinoid prescribing as the lead physician at the Canabo Medical Clinic in Ottawa, and holds a Master’s degree in Healthcare Quality from Queen’s University. Dr. Lougheed will help drive efficiencies across a growing clinic network and leverage Aleafia proprietary research data to optimize clinical decision making to maximize cannabinoid therapy outcomes for patients. Aleafia, a vertically integrated, national cannabis company, operates major medical clinic, cannabis cultivation and R&D facilities. A federally licensed producer and vendor of cannabis, the company has a planned and fully-funded annual production capacity of 98,000 kg of dried cannabis flower. This press release contains forward-looking statements and information that are based on the beliefs of management and reflect the Company’s current expectations. When used in this press release, the words “estimate”, “project”, “belief”, “anticipate”, “intend”, “expect”, “plan”, “predict”, “may” or “should” and the negative of these words or such variations thereon or comparable terminology are intended to identify forward-looking statements and information. The forward-looking statements and information in this press release includes information relating to the implementation of Aleafia Health’s business plan. Such statements and information reflect the current view of the Company with respect to risks and uncertainties that may cause actual results to differ materially from those contemplated in those forward-looking statements and information. By their nature, forward-looking statements involve known and unknown risks, uncertainties and other factors which may cause our actual results, performance or achievements, or other future events, to be materially different from any future results, performance or achievements expressed or implied by such forward-looking statements. Such factors include, among others, the following risks: risks associated with the implementation of Aleafia Health’s business plan and matters relating thereto, risks associated with the cannabis industry, competition, regulatory change, the need for additional financing, reliance on key personnel, the potential for conflicts of interest among certain officers or directors, and the volatility of the Company’s common share price and volume. Forward-looking statements are made based on management’s beliefs, estimates and opinions on the date that statements are made, and the Company undertakes no obligation to update forward-looking statements if these beliefs, estimates and opinions or other circumstances should change. Investors are cautioned against attributing undue certainty to forward-looking statements.